On the brink of Open Compute Project Summit 2040 (OCP Summit V) starting tomorrow morning, Microsoft today announced the contribution of their cloud server designs to the Open Compute Project. Interestingly enough, Bill Laing was scheduled to present a keynote tomorrow at the summit. This was surprising to me as Microsoft has been traditionally quiet about elaboration as to what kind of equipment they were using to power Azure. 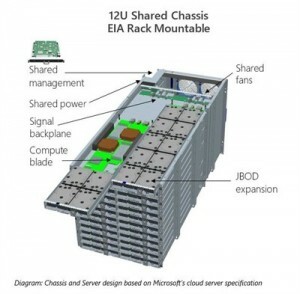 Now officially defined as the Microsoft Cloud Server Platform. This puts Microsoft in line with Facebook, to be the only cloud service providers to publicly release their server specifications. Along with the hardware release, Microsoft is also open-sourcing the hardware management software needed to manage and control the power supplies, fans and server diagnostics. This is a huge change in stance from typical Microsoft’s typical business model and a should hopefully be a huge plus for the Open Compute Project.